Villa D’Este Tour Includes: Our Villa D’Este tour includes private transportation, service of English speaking driving guide, tolls, parking, taxes. Not Included: Entrance fees to sites. This privately guided day tour features Tivoli, a historic hilltown and one of the most popular destinations for day trips from Rome. You will drive one hour from Rome before reaching Tivoli, where you will bask in the beauty of its magnificent gardens and fountains of the famous Villa d’Este. This was the Renaissance residence of Cardinal Ippolito d’Este in the mid 1500s; the playful fountains and “water games” here were created from the plans of such famous artists and architects as Bernini and Pirro Ligorio. 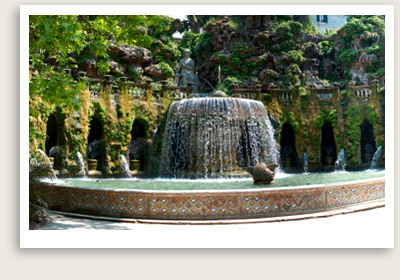 Your will tour the villa’s extensive gardens with its numerous fountains, pools and artistic pools of running water. This garden was created to please all. This is one day trip from Rome we highly recommend. Extend this tour so you can lunch at a historic restaurant right next to a ruin. During warm weather you can have a table outside next to the ruin and with a view of the of the city of Tivoli.